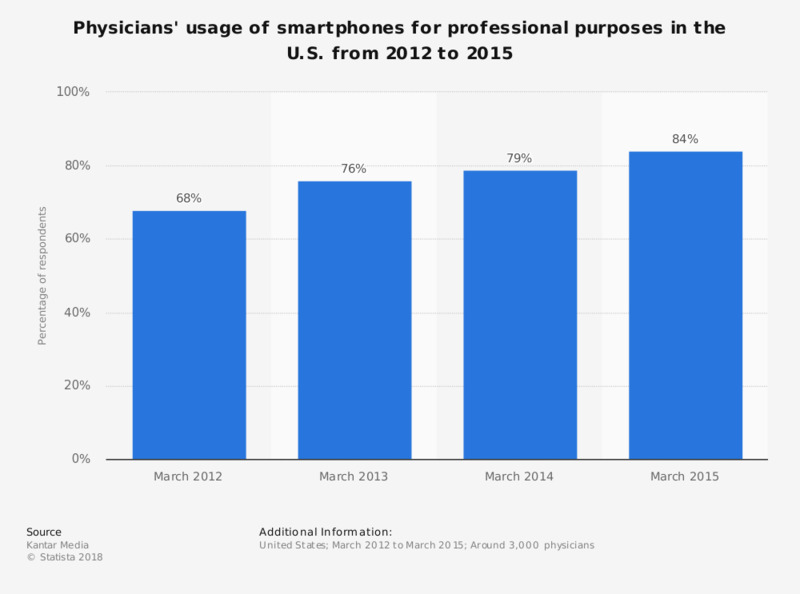 This survey indicates the percentage of physicians in the United States who use smartphones for professional purposes from March 2012 to March 2015. In March 2014, 79 percent of surveyed physicians used smartphones for their medical practice. Use of digital health has grown in the medical industry as consumers are expressing increasing interests in mobile health technologies. Usage of smartphones among physicians in the United States has risen. From 2012 to 2015, 68 percent to 84 percent of physicians, respectively, reported using their smartphones for professional purposes. Digital health has become more widespread globally among the medical industry. In the United States, 85 percent of physicians reported that they had already implemented electronic medical records by 2014. However, it has been proposed that the adoption of smartphone usage among doctors has started to plateau. The use of tablets is also becoming more common among doctors in daily professional procedures. Digital technologies provide a new approach for consumers in regards to the accessibility to information and to physicians. Over half of U.S. adults used the internet to search for a specific disease or medical problem in 2012. Digital technologies have altered the way that patients undergo treatment. For example, over half of U.S. consumers would send a digital photo of a rash or skin problem to dermatologists for an opinion and 38.6 percent of patients would be willing to have a live visit with a physician via a smartphone app. The global mobile health industry has risen rapidly and is expected to reach 55.9 billion U.S. dollars by 2020.